"Toto... I have a feeling we're not in Kansas anymore." --Dorothy. "Ding Dong the Witch is Dead" (a .WAV file). "Follow the Yellow Brick Road" (a .WAV file). "I'm a failure because I haven't got a brain." 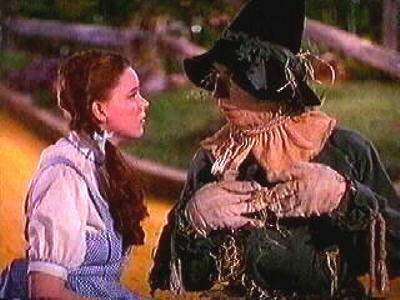 --The Scarecrow (a .WAV file). "What would you do with a brain if you had one?" -- Dorothy (a .WAV file). "If I Only Had A Brain" (a .WAV file). "I'm not a witch at all. 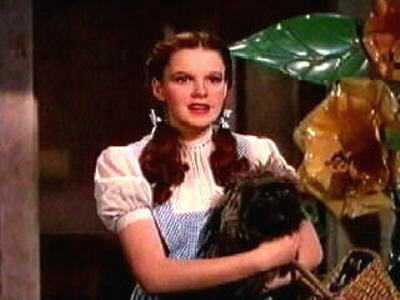 I'm Dorothy Gale, from Kansas." -- Dorothy. "I'll get you, my pretty,... and your little dog too! Ah ha ha ha ha ha!" --The Wicked Witch of the West. "It's always best to start at the beginning, and all you do is follow the yellow brick road." --Glinda, The Good Witch of the North. "My! People come and go so quickly here!" --Dorothy. "Some people without brains do an awful lot of talking, don't they?" --The Scarecrow. The sound of the Tin Man being oiled. "Not nobody! Not no how!" --The Lion. "Trapped! Trapped like mice, uh, rats." --The Lion. "Lions and Tigers and Bears! Oh my!" Wondering about that supposed hanging on the set when Dorothy meets the Tin Man? Read my article on "The Hanging Rumor." "Put 'em up! Put 'em up!" 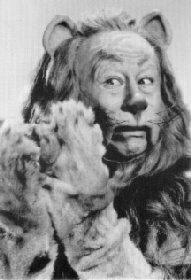 --Bert Lahr as the Cowardly Lion.